I’ll admit that I was skeptical about this week’s recipe for French Fridays with Dorie. The choice was a Caramel-Almond Custard Tart. The recipe reads like a sweet quiche with nuts on top and that just didn’t seem appealing. However, I enjoy my Fridays with the Doristas, so I soldiered on. 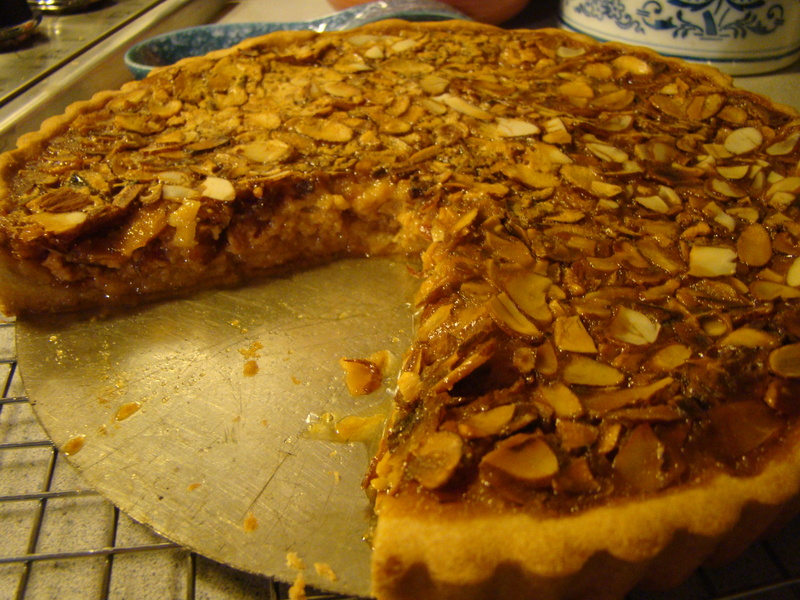 Each time we use it, I remember that the sweet tart crust is one of my favorite discoveries in Around My French Table. The cookie-like crust comes together easily, and I love the press-in method, with no rolling or waiting required. The filling starts with a simple caramel. I think I’m gradually losing my fear of molten sugar. This caramel is slower to brown than others. I think because it’s more like caramelizing a heavy sugar syrup than just plain sugar. That also made it less scary. It boiled madly for a few minutes and then turned a lovely shade of brown and was ready. My caramel did seize up when I poured room-temperature cream over it, but it smoothed out, just as Dorie promised, after sitting for a few minutes. While the caramel rested, I whisked eggs with sugar, salt, and milk to make a custard base, then added the caramel cream. At this point, I was still reminded of quiche filling. 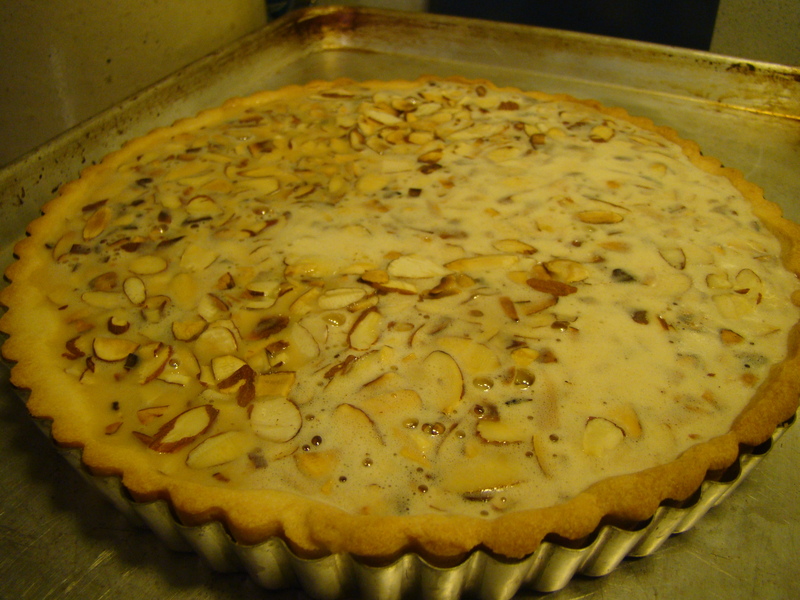 Toasted sliced almonds are scattered over the tart crust, then the filling gets poured on top. The tart was practically overflowing, so it was challenging to move the pan to the oven. I did manage to do it without spilling a single drop. The tart needed to bake for a long time. After 35 minutes, it had not puffed at all. After 45 minutes, it started to puff on the edges, but not the middle. After 55 minutes, the middle was puffed but still very jiggly and not feeling firm. I finally decided it was enough after about 65 minutes, which was 20 minutes more than the recipe said. It was also much later than I anticipated. I was hoping the tart would cool down to close to room temperature so we could try it before bedtime. Wanting to taste won out over waiting for it to reach the ideal temp, so the first try was on the warm side. To my surprise, it didn’t taste quiche-y at all. In fact, it reminded me of a warm pecan pie made with almonds, even though the fillings are drastically different. I really liked it. Howard was less sure. I had a cold piece with breakfast to see if the texture changed after the tart cooled down. I found the filling smoother this morning and still delicious. To see what the other FFwD participants thought of this tart, follow their links here. I can’t find the recipe online, but you can always find it in Dorie Greenspan’s book Around My French Table. When it comes to cookies, I think I’m a lazy baker. I’m sure I’ve already mentioned that I love the convenience of a few rolls of refrigerator or icebox cookie dough stashed in the freezer. Bar cookies are a close second as my other favorite type of cookie to bake. There’s no fussy shaping. You bake, cool, cut, and you have cookies for a crowd. My latest quest is to come up with a few base recipes for my favorite baked goods, recipes that have the texture I prefer, but can be varied with mix-ins based on what I have around or what I crave. I’m still working on scone recipes that makes the grade, one with buttermilk and one with cream or sweet milk. However, I think I’ve struck gold with a chewy bar cookie. I’ll warn you that this bar cookie is very sweet, but the texture is meltingly good. It uses melted butter, so there’s none of the preplanning involved with recipes calling for room temperature butter. Other than measuring cups and spoons, this can be mixed in the saucepan where you melt the butter, so cleanup is minimal. I’ve made this with nuts, nuts and chocolate, and, most recently, with oatmeal and dried fruit. I think your imagination can take it in some many different directions. Preheat the oven to 350F. Lightly grease a 13×9-inch pan. In a large saucepan, melt the butter over medium heat. 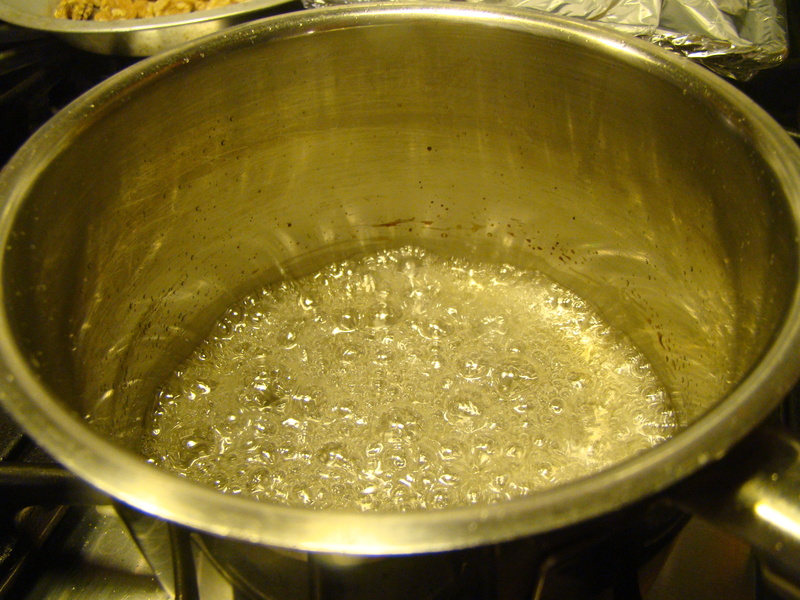 Remove from heat, and add the brown sugar, and stir to combine completely. There shouldn’t be any dry sugar left. Cool for 5 minutes. Stir in the eggs and vanilla. Mix in the flour and salt. Now add your desired mix-ins and stir well. Transfer the batter to the prepared pan. It will be stiff, so it probably won’t pour in. Use an offset spatula to spread the batter evenly in the pan. Bake for 25-30 minutes, until the top is set and lightly browned. Cool in the pan for about 15 minutes, then remove the entire slab from the pan, and continue cooling on a wire rack. 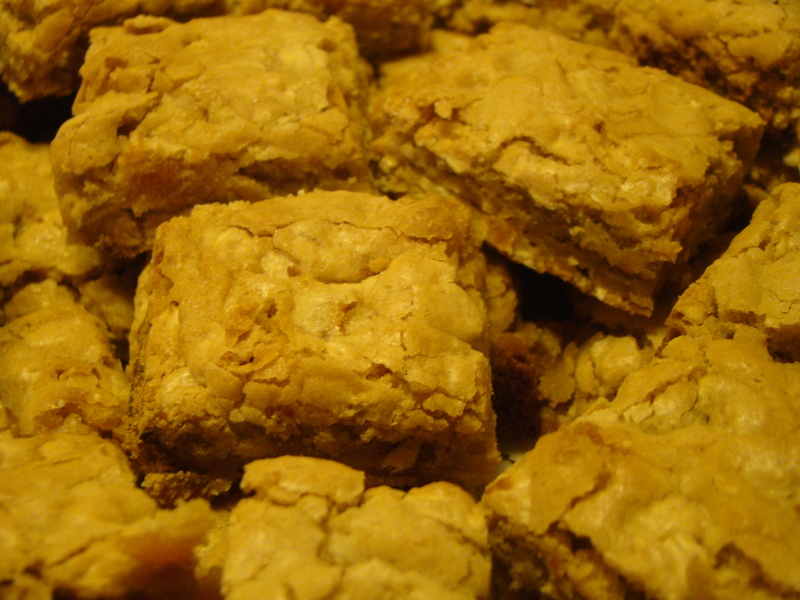 When slightly warm or at room temperature, cut into squares. I prefer 1½-inch squares, but you could make them bigger, smaller, or even a different shape. Cutting larger squares in half to make triangles are pretty. 1 cup chopped nuts. Pecans are particularly good.